Do you want to be able to resist attacks, be impervious to stresses, and always be capable of effective action? You need to know what to wear. What can you possibly wear that can guarantee success in the face of attacks, stresses, and the difficult challenges that will come your way ? You can’t buy it anywhere. It has to be custom made and is only available from one Divine Design Source. Not the first things we might think of in describing a woman or her clothes. But, God says these are what the really well dressed woman is wearing. 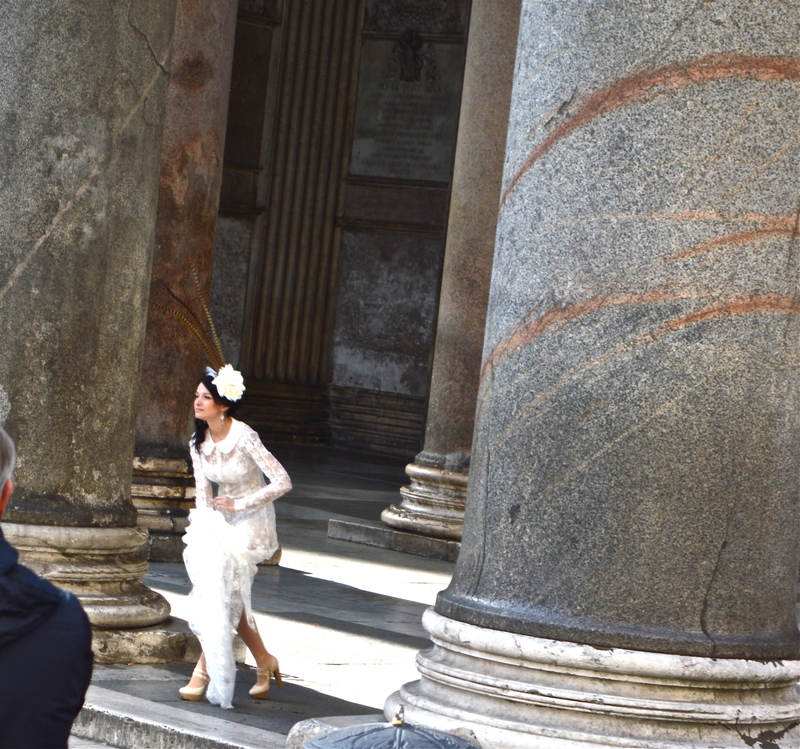 Do you recognize this photo of the Italian Fashion model that I encountered early one morning on the steps of the Pantheon in Rome? I used her dress as an example of the Splendid Garment in an earlier post focused on Proverbs 31:22. This is the second time our Proverbs 31 woman has been described literally wearing strength. The Free Dictionary has a long list of definitions for strength, but I’ve included just three because I think they give us a very practical understanding of what strength is and how it allows her to be successful throughout her life and enables her to laugh at the prospect of aging. The power to resist attack; impregnability. The power to resist strain or stress; durability. Capacity or potential for effective action: a show of strength. Are you surprised at the meanings of strength? I’ve moved strength way up on my Prayer List. Who doesn’t need the ability to resist attacks? The enemy is constantly attacking our thoughts, our health, our emotions. He’s looking for our vulnerabilities and plotting our downfall. But, I’ve never asked for the strength to resist the attack. That’s my new specific request. And the ability to resist stresses and strain are another revelation of how God desires to strengthen us. He knows that some trials are marathons not sprints. Sometimes we need the patience and faith to wait while He works in others. He wants us to possess the capacity for effective action. Think of the potential in your everyday life. Parenting constantly requires effective action. God is saying our Proverbs 31 woman has this ability. It’s available to us for the asking. Dignity, or honor, is the second description of her clothing. The Hebrew word means ornament, adorning, or decoration, majesty, honor, or glory. Only God can give this. All good things originate with Him. All beauty, majesty, comeliness are His alone to bestow. He pours these into our lives and we simply reflect His honor, glory, and beauty. As women, as American women, we are surrounded by a culture of youth and beauty. Worse still, those two are seen as necessary partners. The cultural message is that you can’t be old and beautiful. Our Proverbs 31 woman literally laughs at the time to come. Again, the meaning of the word adds immensely to understanding what God is telling us. In Hebrew it means to laugh or smile upon, but mockingly or in contempt and derision. How can she laugh at aging? This same word is used of laughing at a person who is threatening to do much, but is able to do nothing. The little brother swinging away at the bigger brother who is standing at arms length with his hand on his younger brother’s head. The little guy is swinging as hard as he can, but he isn’t able to connect or do any harm if he did. That’s why she laughs at the time to come. She’s holding it at arms length by her strength and honor. Time can’t touch her, not really. She has the last laugh. Would you like more promises about strength? been going through difficult situations lately… thanks for the encouraging words! Remember Psalm 34:18 (ERV) The Lord is close to those who have suffered disappointment. He saves those who are discouraged. Praying that you find His peace even in the difficulty.